With 1.5 million inhabitants Oran is the second largest city in Algeria. It is located along the Mediterranean sea, about 170km east of the border to Morocco. Oran has a harbour with ferry connections to Spain (Almeria, Alicante). The city doesn't have as much historical heritage as Algiers and Tlemcen, but is pleasant and less chaotic than Algiers and is embedded in a scenic coastline. The historic core is centered around the 1st November square next to the Bey palace. This is a not too hectic area which can be easily explored on foot, starting from the 1st November square and moving south towards the Great Library (the former Sacred Heart Cathedral of Oran). The highlight of Oran is Santa Cruz, a place on a 400m mountain with a fortress and a church. From here there are great panoramic views of Oran and the bay of Mers el Kebir, where the port of Oran is extending. Oran was founded in 903 AD by Andalusian muslims and quickly became a flourishing regional trading centre. Between 1238 and 1509 it was ruled by Tlemcen, then by the Spaniards with a short interruption until 1792. The French occupied Oran between 1831 and the Algerian independence in 1962. 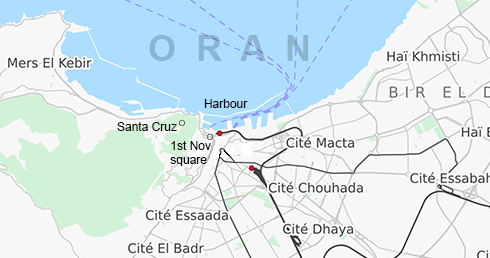 Oran has an international airport with connections to Europe, North Africa and the Middle East. It can also be reached by ferry and there are train connections to Algiers. By car it takes four hours to reach Algiers. Oran has several hotels, many of them bookable via online booking portals.